The free SmartThings app has been redesigned for easier navigation and a more intuitive experience. One of the first things you’ll notice is that we’ve updated the organization of the app. On the bottom of the screen, you’ll notice five icons corresponding to the main areas of the app: Dashboard, My Home, Routines, Notifications, and Marketplace. The Dashboard will be where you access Smart Home Monitor to check the status of your home, see what’s happening right now, and adjust settings for monitoring and notification. For existing SmartThings users, the Dashboard will contain everything you are used to seeing today except for the Things view which has been moved under My Home. While there are improved ways to achieve the same things, SmartThings solutions such as Doors and Locks, Lights and Switches, and Damage and Danger will continue to exist alongside the new installation of Smart Home Monitor. Once you’ve grouped your smart devices by room, you can also select a “featured device” that will appear prominently at the top of the screen within each room. 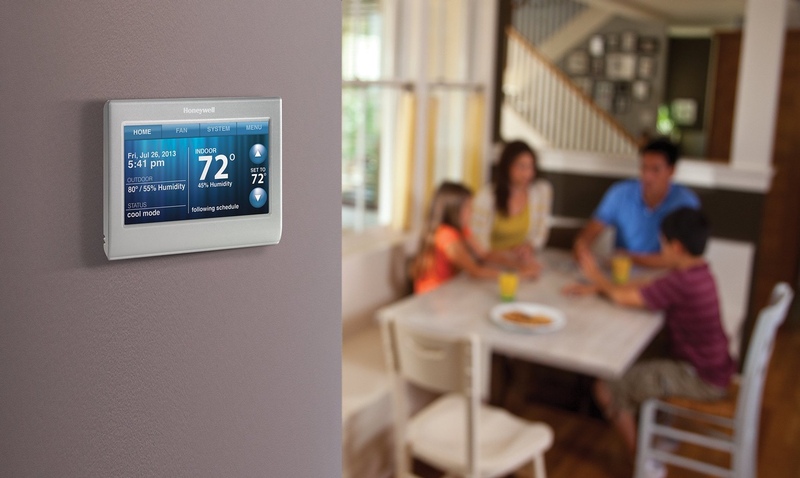 The featured device is intended to be the most important or most frequently used device within each room and offers rich control capability to help you brighten and dim your lights, adjust your thermostat, lock and unlock your door, access camera feeds to see live footage of what’s happening in your home, and more. My Home also provides a view of all of the Things in your home with current status, a list of SmartApps you have installed, and, if you have connected individual family members to SmartThings, you can see a summary of who is at home. 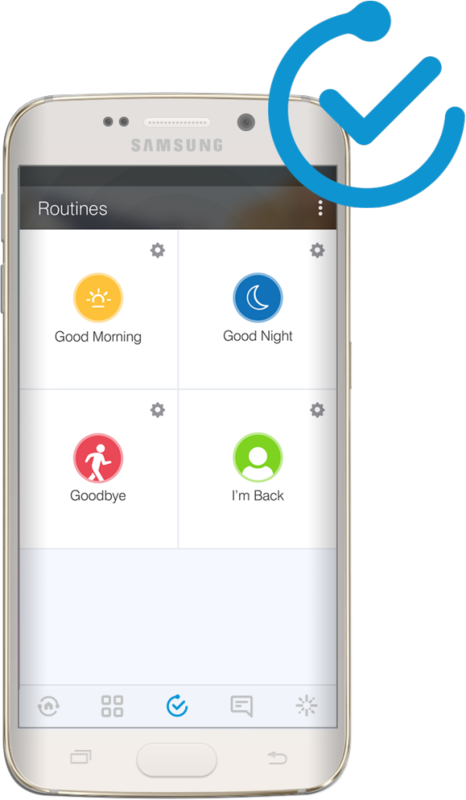 Routines allows you to personalize how your smart home works by customizing different actions to automatically happen when you wake up, go to sleep, leave for the day or return home. You can even create new routines to accommodate your lifestyle. 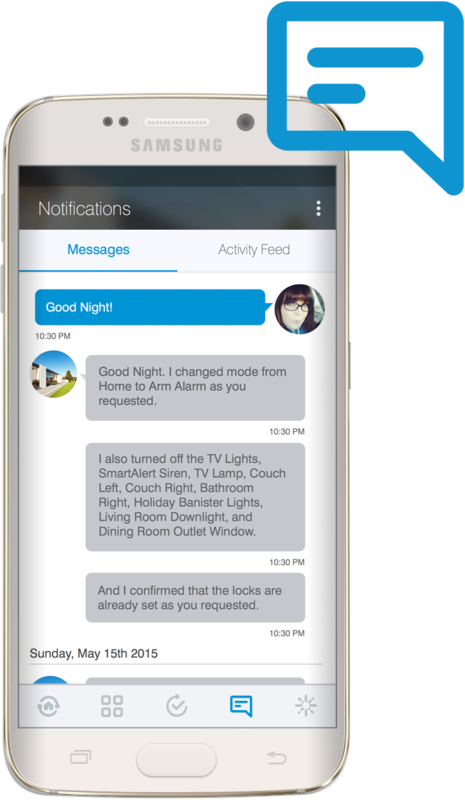 Notifications keeps you up to date on what’s happening in your home through two sections. 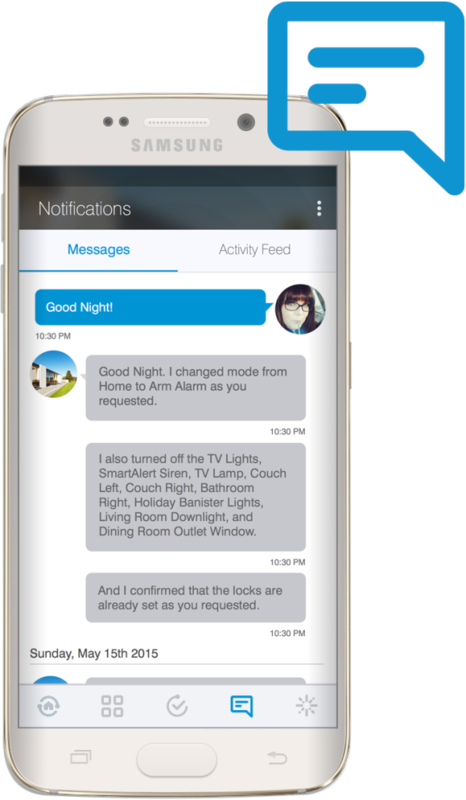 Messages provides a summary of the actions SmartThings has taken at your request, and notifications or alerts you’ve asked to receive. Activity Feed is a running list of all events from your connected things, such as motion, temperature, doors opening and lights turning on and off. 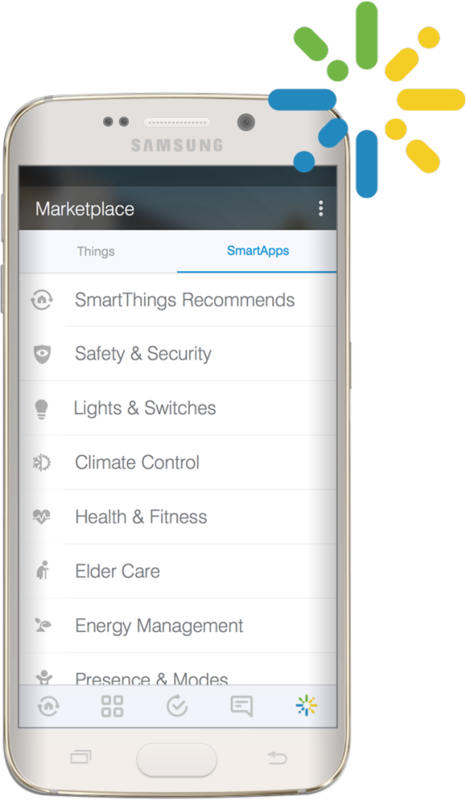 Marketplace is the one destination to browse and discover a full list of SmartThings-compatible devices (Things) as well as SmartApps developed by the SmartThings team and developers from the community. Two of the most important SmartApps are described in more detail below. 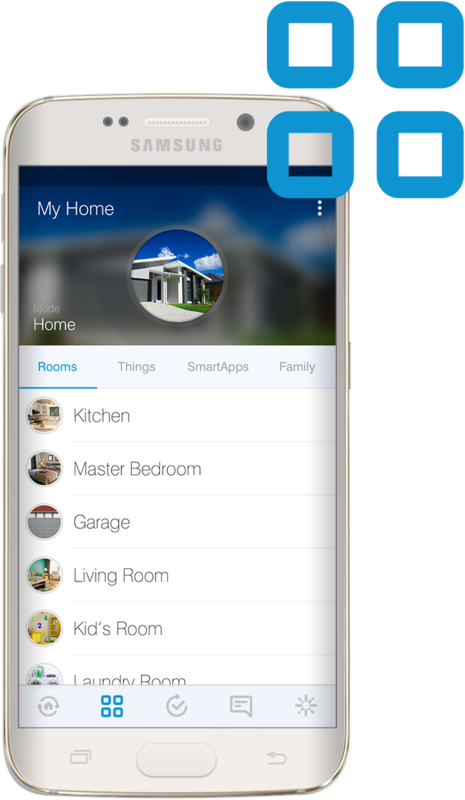 One of the most exciting new features of the new SmartThings app experience is Smart Home Monitor—an integrated home monitoring solution. 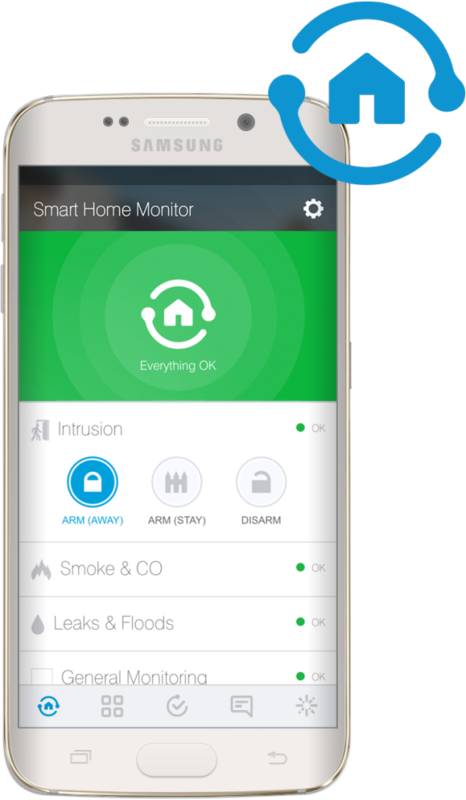 Smart Home Monitor allows users to receive alerts and take action when SmartThings detects unwanted entry or motion, smoke or fire, leaks, or other important activity. Existing customers will see Smart Home Monitor in their dashboard within a day and new customers will have it automatically installed and ready to configure. With Smart Home Monitor and a connected camera, customers can also get instant alerts with an accompanying video-clip when these unexpected events occur. Video buffering in the hub means clips can start prior to the event so you can see exactly what is happening in your home. 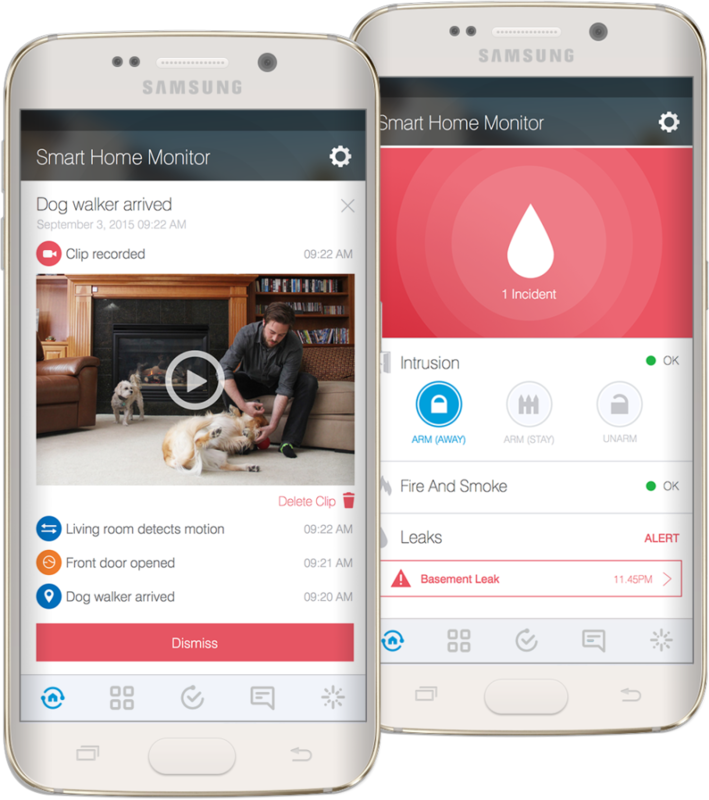 SmartThings video functionality is currently in beta and can be accessed with cameras from Samsung and D-Link. Smart Home Monitor is organized into four categories: Security, Smoke, Leaks, and Custom—which allows you to customize different things that may not fall into any of the other three categories. Within each category, there are default settings to help you choose what you’d like your smart home to do. For example, an intrusion alert could automatically trigger several actions: capturing video, sending you a notification, turning on a light, and setting off an alarm. And, of course, you remain in control and can determine the best response—whether you decide to call your plumber, notify the police or turn off an alarm. The core Smart Home Monitor application is available for free to all users. Video clips will be a premium feature within Smart Home Monitor but are available in beta as a free trial through 2015. After the free trial, a premium version of Smart Home Monitor, which includes video clips, will be available for $4.99 per month. Live streaming will always be free. Smart Lights delivers a simple tool to configure and customize how lighting works in your home. You can automate your lights and switches based on a variety of events, including: motion, when people arrive and leave home, at sunrise or sunset and more. Please visit the SmartThings Knowledge Base for more information and setup help.